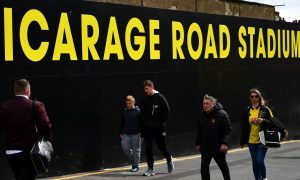 When Tottenham travelled to Vicarage Road last Monday, Mauricio Pochettino – obviously wary of Watford’s two striker setup – moved to a three centre-back formation, a move which was ultimately vindicated by Heung-Min Son’s 89th minute winner. Five days later, when City travelled to Vicarage Road, Manuel Pellegrini – obviously less wary of Watford’s two striker setup – did not move to a three centre-back formation, and after just ten minutes into the match, City fans everywhere would be forgiven for wondering why he didn’t. Having watched Mangala and Otamendi stuggle to play well together for most of the season, it certainly wasn’t a stretch to see the team sheets and think Ighalo and Deeney could pose real danger to City’s back line. Watford’s 4-4-2 has worked so well this season, in part because of how well Ighalo and Deeney compliment each other. Deeney, often reminiscent of a poor man’s circa 2009 Wayne Rooney, drops deeper than Ighalo, often forcing one of the opponent’s centre-backs to step forward. That movement frees Ighalo to play one-on-one with the remaining centre-back, a tactical and physical advantage in Watford’s favour. The second tactical element of Watford’s 4-4-2 is the efficient man marking from their front line during their opponents first phase of play. When City try to play from the back, the primary pass out of defence is played by one of the two centre-backs, and while this isn’t unusual or unique to City, it can be a much riskier way to build play when the opponent is defending with a two man front line, in which both strikers are occupying the centre-backs. On Saturday, Mangala looked nervous on the ball and struggled to track Deeney’s runs. These errors (both of which led to early Watford chances), could have been mitigated had Pellegrini chosen to play a third central midfielder – Delph, perhaps – allowing Fernandinho to play deeper (almost between the centre-backs like Eric Dier did the week before) and mark Deeney when he dropped deep. But with just two central midfielders, Fernandinho was occupied in other parts of the pitch marking entirely different players. In the attacking phase, City struggled early and often, due mostly to Silva’s inability to get on the ball and influence the play in the final third. When City (and others) play a 4-2-3-1, the #10 is the primary catalyst for City’s play in the attacking phase. Yaya Toure, playing in the central midfield two and protected by Fernandinho, builds and distributes from deep, while the #10 – in this case, Silva – is asked to take up positions between the lines and become available for the initial passes into the attacking third. On Saturday, Silva was noticeably absent; completing fifteen of just twenty attempted passes in the first half (and 35 of 43 in total). That’s just not enough on the ball influence from City’s #10. It’s no secret that City are often at their very best when Silva is pulling the strings in the final third, but when he’s off form, he struggles to impact games and as a result, City struggle to maintain any offensive pressure. This is all well and good, but I can hear you saying “you haven’t said a thing about the good things yet.” You’re right, and that’s mostly because up until Yaya’s worldie, where were the good things? It was another away performance in which one or two players carried the team until the pivotal moment. Fernandinho was again magnificent and should be probably receive credit for being the club’s most consistent performer across the 2015 calendar season. He’s rarely flashy (mostly because that’s not what he’s asked to do) but his role is pivotal and consistently performed with great aplomb. He’s a truly elite central midfielder who can play deep or box-to-box, who can build comfortably and efficiently from the back, while consistently positioning himself in the correct off-the-ball positions. And at the back, Joe Hart continues to prove that despite City’s riches, there will always be opportunity for transfer market value. At this point, is there really any goalkeeper in England that City fans would rather see behind the sticks? His primary weakness – distribution – has improved massively since Pellegrini’s arrival and he’s continue to improve his shot stopping and area command. Pellegrini, needing a goal and chasing the game, brings off City’s best attacking player and doesn’t change the system. Quite simply, it can be difficult to accurately analyse the effects of a manager’s substitutions as cause and effect are often confused. While true that City flipped the scoreline after Pellegrini’s changes, is that a direct result of said substitutions? Rephrased, how exactly did Pellegrini’s changes influence Yaya’s equalizer off a corner? And was Sagna’s sublime cross and Aguero’s subsequent header really a result of Navas and Bony being present on the pitch? Admittedly, the second change was a creative way to get a second striker on the pitch without sacrificing any offensive strength, but taking off Sterling to put on Navas remains an uninspired reaction to being down one (or two). In any case, it’s three points gained. Our focus must now switch to a week of domestic cup fixtures, kicking-off with what should be an excellent match away at Everton.